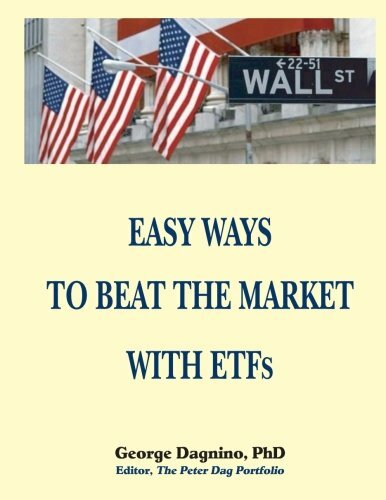 EASY WAYS TO BEAT THE MARKET WITH ETFs: This book will show you how to minimize the losses on your investments. The performance of several portfolios ... returns are also discussed in detail. I will show you several ways to invest your money and each one will have different features in terms of returns and risk. This book discusses how to deal with two main issues. The first one is the issue of managing risk. The paramount objective of any investor is to minimize losses. The second issue is the need to manage returns. In order to do so you have to rely on a framework to direct your money. You need a process. I am going to show you specific portfolios and the rules I used to achieve the returns. These rules are simple and easy to follow. I will show you the performance of the portfolios and the risk associated with following the methodology. Some portfolios and strategies will outperform handsomely the market over a long period of time with low risk. Others will outperform the market and reflect higher risk. These features will be quantified. I will use these data to make some important points about diversification, choice of asset classes and performance of high risk strategies. The reason we will discuss many portfolios is because of their different features. The interesting outcome of this analysis is that you will be able to recognize very specific and important patterns you can use to your advantage. However, before showing you the specific portfolios and their attractive historical performance I need to tell you why and how I found them. In other words, what was my mental process to find these portfolios? In order to do so I will discuss in Chapter 1 the concept of risk. What is risk? Why is it important? What are the tools needed to manage it? But there is another important concept I need to discuss. The growth of the economy determines which types of investments you should make. The growth of the business cycle drives the prices of all assets. Why does the economy go through periods of faster or slower growth? This issue will be explained briefly in Chapter 2. In Chapter 3 you will learn to recognize whether the economy is growing rapidly or slowly. In Chapter 4 I will discuss the importance of understanding the economic environment you are currently facing and its impact on the main asset classes and ETFs. Are all market sectors attractive during a complete business cycle? If not, which ones are more attractive when the economy is growing slowly and which ones offer the best returns when the economy is strong? In Chapter 5 I will show you a few simple and yet powerful indicators to determine the strength of the economy. These gauges will tell you whether the economy is strengthening or slowing down or whether it is growing slowly or expanding at a rapid pace. Why is it important to know how the economy is doing? This knowledge is crucial to determine whether you are facing a bull or a bear market and which asset classes, or sectors of the market, you should favor. In Chapter 6 I will discuss an easy and yet powerful way to determine the main trend of the market. I have run several tests with different moving averages. But only one moving average shows superior performance. In Chapter 7 the major market sectors are studied using the model developed in Chapter 6 for the broad market. The purpose of this analysis is to determine which moving average provides the best return. Using this method it will be easy to recognize which ETF is most volatile and likely to offer the greatest risk and loss (drawdown). Chapter 8 shows you 14 ETF portfolios. Every portfolio has been tested with the model discussed in Chapter 6 from 2003 to 2015, a period with two bull markets and a major crash as in 2007-2009. Each portfolio is ranked for its overall performance, the maximum loss during the test period, its level of risk, and the number of trades performed during the period. Chapter 9 will summarize the main issues raised in this book and the practical implications you should consider in the management of your money. Good reading!